In the past decade, policymakers and commentatorsacross the world have called for the introduction ofcopyright reform based on the fair use model in theUnited States. Thus far, Israel, Liberia, Malaysia, thePhilippines, Singapore, South Korea, Sri Lanka andTaiwan have adopted the fair use regime or its closevariants. Other jurisdictions such as Australia, HongKong and Ireland have also advanced proposals tofacilitate such adoption. This article examines theincreasing efforts to transplant fair use into thecopyright system based on the U.S. model. It beginsby briefly recapturing the strengths and weaknessesof legal transplants. 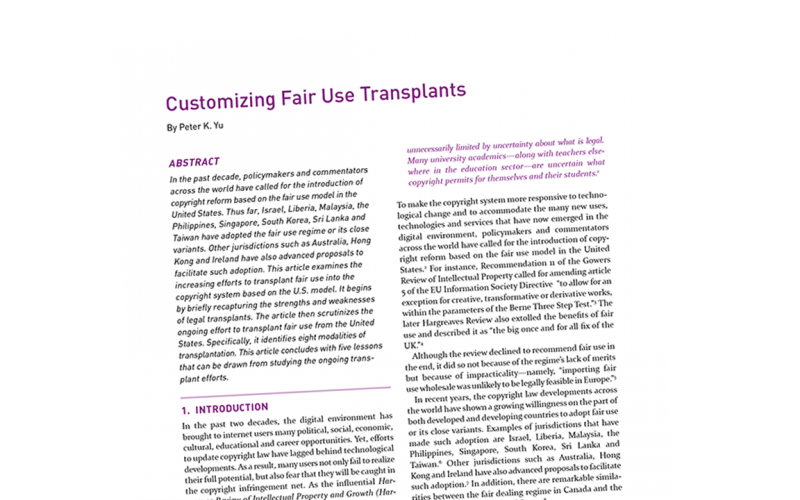 The article then scrutinizes theongoing effort to transplant fair use from the UnitedStates. Specifically, it identifies eight modalities oftransplantation. This article concludes with five lessons that can be drawn from studying the ongoing transplant efforts.